Thinking of staying 3 nights at Las Caletas and 3 nights at either Bosqe del Cabo or Playa Nicuesa. Can someone tell me which hotel would be easier to get to from Las Caletas and how far Bosque is from Nicuesa. Are they in the same general vicinity? I have yet to find a good CR Map with locations of hotels pinpointed on them (with numbered dots or something) so if anyone has a link, pleas share! I haven't done it (yet) but have thought about a split btwn BdC and Playa Nicuesa and to me these 2 would be a little easier. Not sure about a real good map, but if you look here - http://www.osaproperty.com/images/maps/osapeninsula.jpg Las Caletas is just South of Drake Bay, BdC is at the point (where it says Cabo Matapolo) and PN is approx where San Josecito is. Not shown but just SE is Golfito, and you can take a boat from Peurto Jiminez to Golfito, where the people from PN can pick you up. tully -- Thanks for the map. That helps A LOT! I guess I was also thinking I could also save a little money by dividing stay at Caletas with the bonus of spending time around Drake Bay. This is a tough choice as I must pick only 2! Have you spent time around Drake Bay? Nope, haven't been to Drake Bay other than to pick up some people on the flight back. I was looking at PN's site and they do say they will pick you up by boat at either Golfito or PJ, so for PN you'd only have to pay for the transfer back to PJ. As far as I know to get to Drake Bay you'd have to get a ride there. I think someone here has done that but forget who, hopefully they'll chime in to give you a better idea how it's done. Ugh. That's what I figured. The earlier flight leaves at 7:00am. Painful. 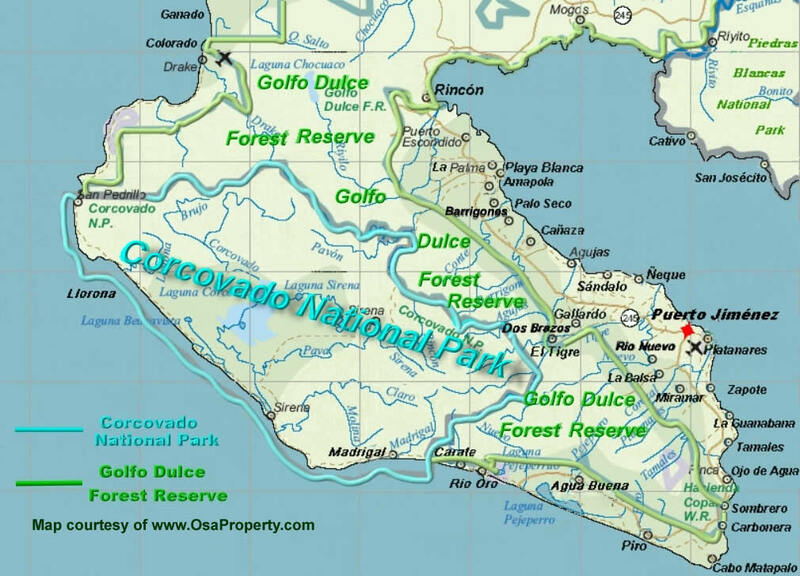 How long does it take to get from Bosque to Puerto Jimenez airport? Depends who's driving Kevin drives pretty fast, I'd say 45 minutes to an hour. When you tell them the time you need to be there they'll tell you when you need to leave. Btw, PJ's "airport" is a gravel strip next to a cemetery. When you arrive, they probably will anyway, but make sure they stop at the little market a minute or so away to grab a drink and use the restroom. Also, there are no facilities at PJ airstrip, so keep in mind if you drink a lot of coffee, like me. I had a very painful flight back to SJO, trust me. As Tully mentioned, there is a plane that stops in Drake Bay on its way to Puerto Jimenez. You could get off in DB, stay for a couple of days and then head on to PJ via the same flight you came in on (just the second half of it). Ground transportation can be arranged via the Rincon road. If you do it that way, possibly Nicuesa could arrange to pick you up by boat someplace before you get all the way to PJ. If not, they can arrange for a boat to pick you up and bring you to the lodge from PJ easily enough. The dock is right near the airstrip. You can then fly home from Golfito after taking a boat taxi from Nicuesa. Kevin can pick you up in PJ no matter how you arrive if you end up at Bosque del Cabo. Bosque has an office where they will ask that you be dropped off if you end up taking ground transportation. Leo at the Bosque office can help you with transportation arrangements or if you go to Nicuesa you could ask them to help-don't know how they are set up for that but worth a try. Most lodges are pretty good about helping. Whew! I've been doing some juggling. >>4 nights at Cabinas las Caletas- (1st night for rest cuz long trip in from Arenal). They said a cab was 2 1/2 hours and $120 to PJ, but I'm still checking other options as well. >>3 nights at Bosque Del Cabo (taking the LATEST flight out on our last day, then spending the night near SJO and flying out in the morn. No stress on flights. P.S. Maybe next time for Playa Nicuesa. Sounds wonderful! I'll be looking forward to hearing about the taxi from Drake to PJ, should be interesting! hipvirgochick: I am also interested how you manage DB to PJ and then to BdC..as that is what we intend to do also. How does BdC coordinate the drive from lodge to airstrip in PJ? Do you just tell them your flight and they leave enough time? How long a wait(beside the gravel strip)? Does this impede in the "check out" time? Hope this part of the trip goes smoothly. shadow12 - BDC is very accomodating with help on both arranging the transfers from PJ which are $25 as well as airfare if you want them to. Suzie2 said they have a little office in PJ where the taxi can drop you off, and then BDC would pick you up. I haven't made firm plans yet since I haven't committed to my lodging prior to BDC, but that's what I've found out so far. As far as departing from BDC. Tully says 45 min to and hour to get from BDC to airport, BDC probably has best guess at how early to arrive. Yes, just work with Leo, Jose et al at BdC and they arrange just about abything! The ride from the PJ airstrip to the BdC offices took only 2-3 minutes (in the pouring rain) as I needed their facilities before the long drive to Carate. They almost always meet all the planes arriving/departing, so if you get there a little early you could always drop your stuff off at the office and go to Carolina's for a bite to eat. Check out at Bosque is usually done the night before you leave particularly if you have an early flight. At least that has been our experience. There is a very good gift shop right by the airstrip. Look for Lapa Rios sign and then just head a little past that. I haven't been in it for a couple of years because we have been driving more but I am pretty sure I remember there being a bathroom there. They open early. I used to ask to get there a little early so I could have time to look around. They will also stop by Jose's gift shop in town if time allows and the other guests are okay with stopping.